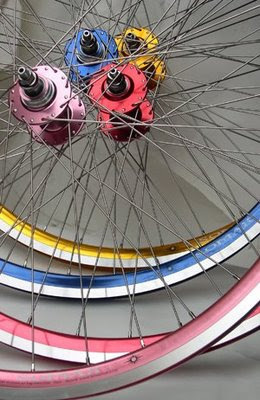 Soma SoMax Track Wheelsets will soon come in pink, red, blue and amber gold. The SoMax wheelsets features our tough sealed cartridge bearing hubs (fixed-fixed) built to 31mm deep aluminum rims. We will also be producing a small run of three-speed wheels using Sturmey-Archer hubs. IN-DEPTH COLOR COMMENTARY:(We know sometimes pictures don't tell the whole story). The red is a strong red that does match our riser and straight bars and Sugino RD Messenger cranks. The gold is an amber gold that is maybe 10% more "orangey" than Sugino RD Messengers, which in turn is 8% more "orangey" than the gold of our bars. We will eventually do the wheels in a regular gold that will be a truer match to our bars. The anodized blue and pink match our straight bars quite well. PLEASE note that anodized colors vary slightly from batch to batch, so these comments only valid to stock on hand. Every time I go to my local super market, I see this translucent wall made of bulk cases of spring water. It pains me to think that 80% of those bottles will end up in the landfills, unrecycled. It boggles the mind to think we can consume so many billions of these bottles a year just for water. Soma wants to gives you one more opportunity to get out of the habit buying cases of plastic water bottles from the supermarket. The Crystal 32 oz. Wide Mouth bottle is for when you are off the bike, in the office, in school, or even on a hike. Use it everyday and you will see you don't need to buy palettes of water anymore. Just fill this with filtered tap water at home. Like our bike bottle, it doesn't leach bisephenol-A or dioxins and it doesn't leave a plastic taste in your water. Available in early December. • Widemouth easily accomodates ice cubes and fits most water purifiers and filters. Easy to clean, too. Happy Thanksgiving everyone, even to my friends who are bulk water bottle buyers. Well not exactly win like in a raffle. And not exactly "this" one pictured. 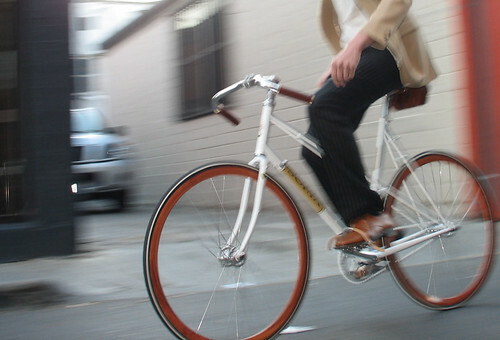 A comparably-built version of the not yet released Buena Vista mixte will be on the auction block at SF Bike Coalition's Winterfest shindig on Dec. 7. So you have to bid to win it. Follow the link to get more info on attending or volunteering at this bash. The custom fixed gear build will be Soma'd out with Oxford bars, Leather Double Toe Straps, Shiner Wheelset Hellyer Cranks and other goodies. American Cyclery will also be donating some parts on it along with their consummate building skills. If the display bike is not your size, you can exchange it through American, though we must warn you that production models are not slated to arrive until January. Follow S O M A f e e d! !